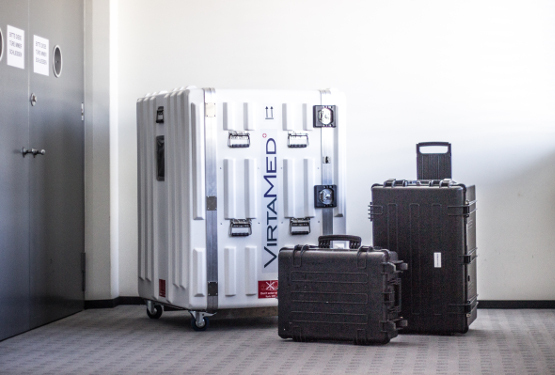 When VirtaMed develops a simulator to showcase what your medical tools are capable of, the simulator naturally comes with tailor-made software conjuring a realistic virtual reality environment. But that's not the end of it: we will also shape the hardware to fit your needs. A good example of our hardware flexibility is the GynoS™, currently served on four different platforms and transported in the variously sized cases featured in the image. Whether your emphasis is robustness, compatibility with other simulators, or easy transport, we have the solution! 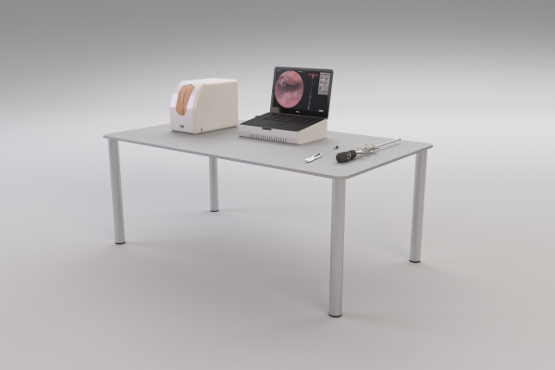 The standard stationary platform comes with a caddy that supports all tools and modules developed for the simulator and features enough USB sockets to connect a wide range of tools simultaneously; furthermore, the caddy is able to carry the entire VirtaMed simulator family. This stylish and clean setup is a great option for those occasions, when you need to make the best possible impression on your audience. 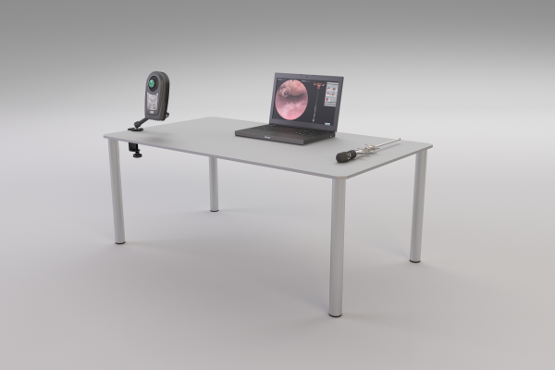 The PelvicSim™ Portable is a lighter version featuring the full-sized anatomical model and a laptop embedded into a small portable base. 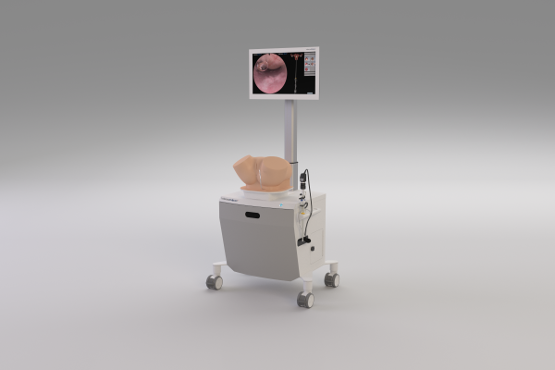 The mobile PelvicSim™ can be transported comfortably from one conference to the other in two luggage-sized boxes, yet it still supports all the gear and software modules required and allows you to plug in several instruments at once. This platform has been used by our clients in conferences around the world. 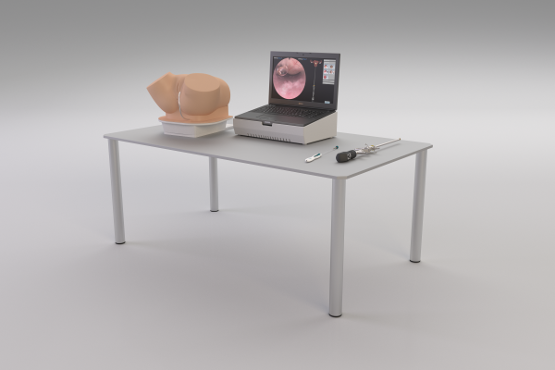 The PelvicSim™Mini is the latest iteration of the PelvicSim™: the anatomic pelvic model is stripped down to contain only the essential parts, and the software can be operated on a simple laptop. The Mini, weighing only 22 kg when packed, is so compact that it can be carried as a single piece of luggage on any commercial flight. This simulator was inspired by Bayer AG's desire to have an agile platform for their frequent travelers. The Mini was developed together with Bayer in mere months. All our simulators enable haptic feedback, either provided by a realistic anatomical model, or by a robotic platform that offers software-based tactile sensation. However, if all you need is a virtual reality environment with original tools, we can provide an even more portable solution for a busy traveler – our custom simulator featuring Simball can be packed into carry-on luggage! This very reduced, extremely portable solution is only available for our VirtaMed GynoS™ and UroS™ modules and comes with highly realistic visual feedback only; no haptics involved. What would your own customized simulator look like, and what could it do for you?